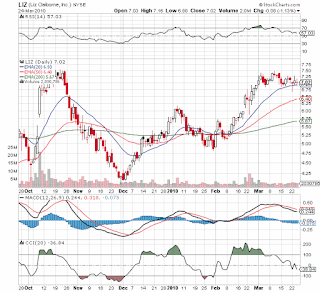 Had sold a portion of Liz Claiborne (LIZ) back in early March as the stock got overheated. 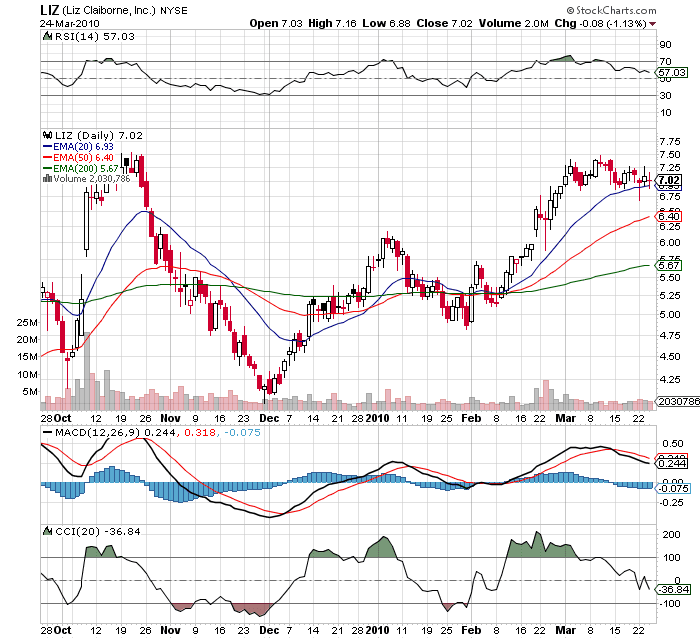 With it continuing to hold above the 20EMA, we used the early morning selloff to purchase our positions back in the Growth and Opportunistic portfolios. Unfortunately we missed the early drop and had to settle for $7.01. With support it will hopefully breakout of the double top around $7.5 on its next run. After all it traded around $20 pre-Lehman and the retail sector is heating up. Its time for the CEO to show some results. Saks (SKS) is approaching those levels and Coach (COH) has already zoomed past the pre-Lehman disaster. It is close enough to Oct 09 highs I'd like to see it break above those levels but as a retailer it could benefit from the next leg up as the employment figures come in and people jump in for a few more months in the consumer is back trade. Is there anyhing specific to LIZ over any of a bevy of other retailers you like? Or just under $10 ? Apple Hits All Time High! Hooplah Just Starting? Japan Paying $200/mt for Coking Coal?